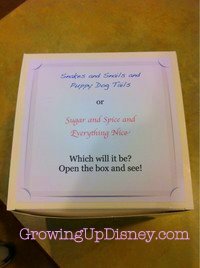 Growing Up Disney: Boy or Girl? Here's how we announced the gender of our little one on the way to family and friends at Christmas. Those are strawberry cheesecake cookies, BTW. Everyone was surprised and very excited. Blend first four ingredients. (Use a mixer for this recipe. It makes a dense dough.) Add cake mix. Drop by the spoonful onto ungreased cookie sheet. Bake for 10-12 minutes at 350. Don't let them get too brown. that's awesome! congrats! and what a cool way to tell everyone! 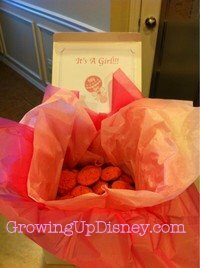 send some of that estrogen over this way... we're hoping for a girl this time!!! Another girl! How exciting!! Hope you're feeling better!